1.Compatible with all USB-charged devices, Smartphones, Tablets, Bluetooth Speakers, Power Bank, PS4, PDA's, GPS digital cameras. For iPad, iPhone 7, 7Puls, 6, 6s, 6 Plus, 6s Plus, iPod Touch, Samsung Galaxy S7, S6, S7, Edge, Note 4, Note 5, HTC one, Sony, LG, Nokia, and More. 2.Unqire design, Fire-resistant and hardened plastic outer shell for durability, build-in premium circuitry and microchip ensure device safety. 3.AC USB charger will charge quickly and efficiently, automatically detects your devices to deliver optimum charging speed. 1.Intelligent circuit design protects against short circuiting, over-heating, over-currents, and over-charging.and automatically end the charging process once the battery is full. 2.Wall charger adapter easy to use, Simply plug in the USB cable, and plug the adapter into the wall. 3.Smallest Available: Very handy to us, Pocket size, Compact, Portable, lightweight, durable, easy to take anywhere. Inside ISmart Technology: Charger with IC chip inside is designed to identify fully charging with safety usage, Protection against over charging,over currents, and over heating, Charging stops when battery is full. 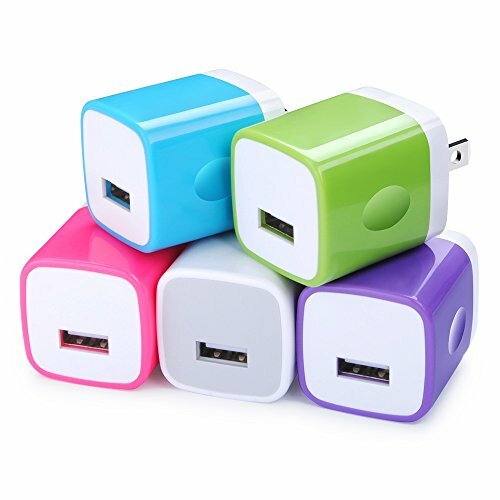 Convenient to Use: Lightweight home charger adapter allows charging at home or in the office via USB cable connection. Simply plug in the USB cable, and plug the adapter into the wall. Compact, lightweight, portable, stylish, easy to store. What We Offer: 5-Pack wall chargers, Lifetime Warranty Guarantee. If you have any question, Please contact to us, we promise to solve your problems within 24 Hours!